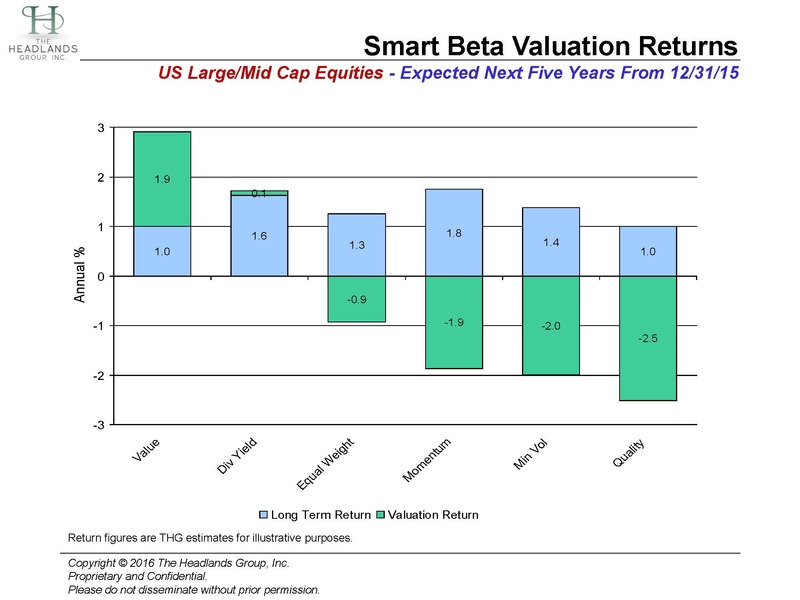 With the outlook for US growth slowing, new smart beta investors in Quality and Minimum Volatility are paying a premium today for the strategies. This premium is so high that their entire expected long-term return advantage is reversed into a return disadvantage over the next five years. Investors in Momentum and Equal-Weighted are overpaying by enough to net them an expected return of essentially zero versus a cap-weighted index (before fees). New investors in High Dividend Yield are getting a fair price that preserves their expected long-term return advantage. The best news continues to be for new investors in Value, who are getting a deep discount that offers them the opportunity to more than triple their expected return advantage (3% vs 1% annually).